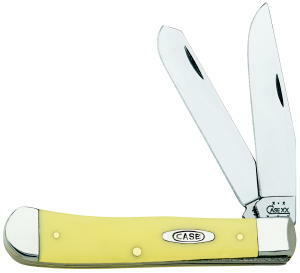 Case 3254-CV Trapper knife pattern with yellow synthetic handles. 4-1/8" closed length with two chrome vanadium blades. Lifetime warranty. Made in U.S.A. Knife Handle 3/8 in. 1-3/8 in. Knife Blade 3/8 in. 2 in.